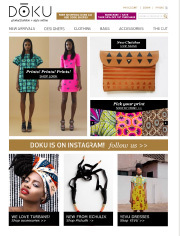 Get great new exposure by partnering with DOKU Fashion Group! Increase sales, brand awareness, and target savvy fashionistas who shop online —at no additional cost to you. DOKU Fashion Group is dedicated to making fashion global by offering an online marketplace featuring designers of color around the world. We present a carefully curated collection of women’s clothing, shoes and accessories from talented, influential designers to consumers in the United States. Our designers are diverse—each constituting one of the dimensions of fashion. With years of e-commerce experience, DOKU makes an excellent partner to help your brand sell more online. 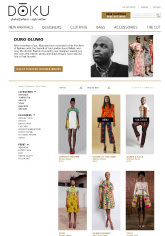 Your clothing will be featured on the Shop DOKU website and will receive a dedicated designer partner page. Users will be able to read the story behind your brand, view your collection, and shop. HOW DOES THE SHOP DOKU PARTNERSHIP WORK? 1. You ship your items to our warehouse in Washington, D.C.
After the transaction is logged, your payment will be processed and sent to you. You will receive weekly reports to view your items’ sales activity and bi-monthly estimated compensation. Partner services will be available by phone and email to answer any questions.